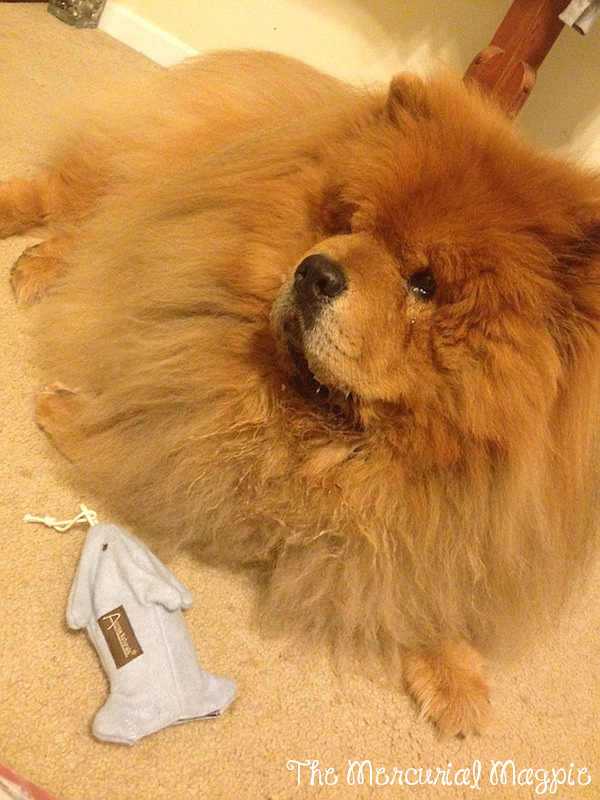 I’ve got something a little different for today’s post- Mugen (my 4 year old chow chow, for those of you who are not regular readers) has been grumbling quite a bit lately about not getting anything on this blog in return for his participation in the daily dose of Mugen photos. 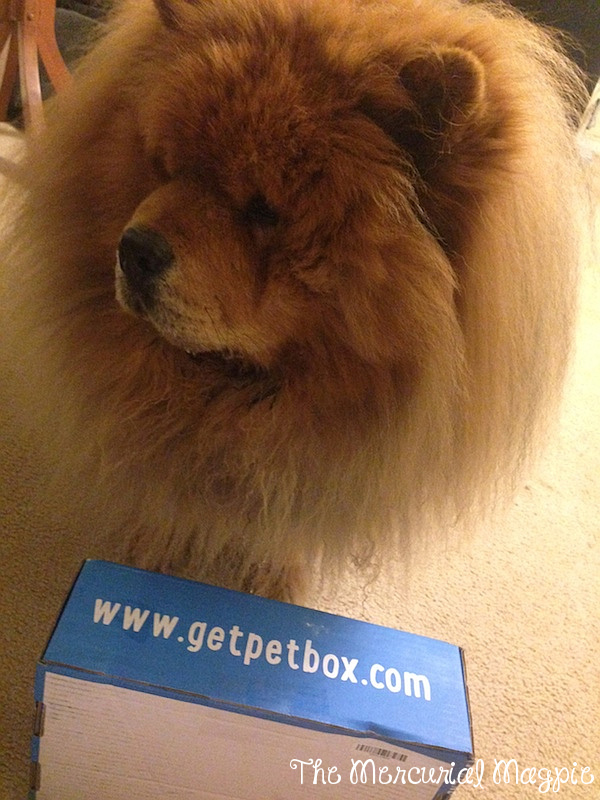 He was getting ready to contact his agent to get the daily feature pulled, but luckily PetBox came to the rescue with something special for him! 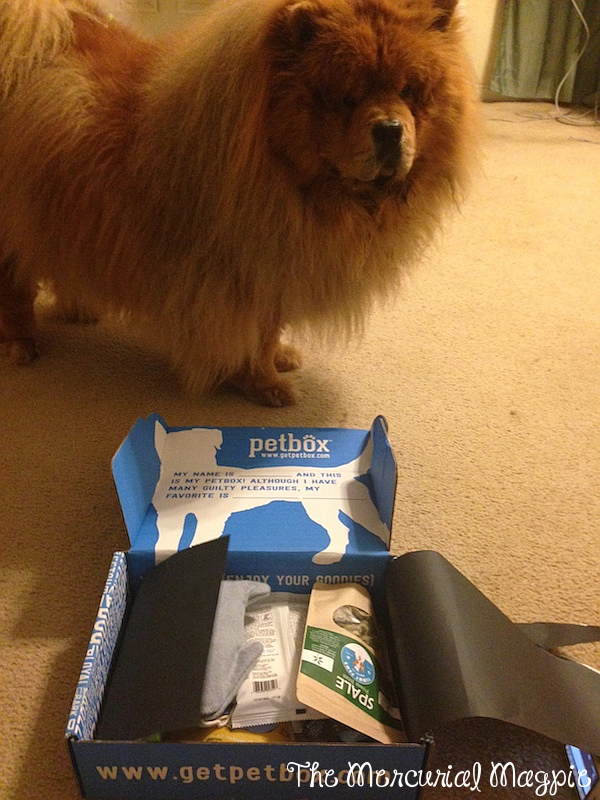 PetBox is a monthly subscription box for cats or dogs. There are different membership plans which start at as low as $29 a month. 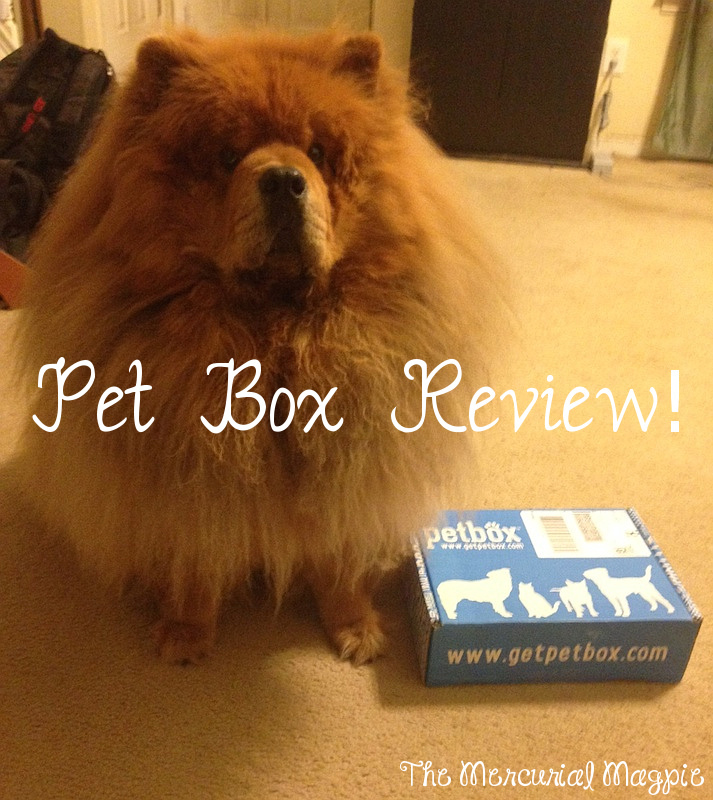 You can either have your box items be selected for you or you can select them yourself-either way, PetBox guarantees a minimum of a $50 retail value in your box. Boxes come once a month and are shipped free within the US. Now, since my box is a review box, it’s not custom-made to Mugen. Let’s take a look at what was inside! BioPel Natural Pest Defense – this is a spray that repels fleas, flies, ants and mosquitoes! It’s safe for use around pets, furniture, bedding & more and has a pleasant lemon scent. Petkin Petwipes – This is a pack of 40 daily use soft wipes that can be used to clean your pet’s face, ears, body and eye areas. They won’t remove spot flea treatments and include aloe, lanoln, vitamins a & e and protein. I was excited to see these in the box because we actually already buy these for Mugen! Wagga Wool Dolphin – This is an awesome toy with a reloadable water bottle inside. When Mugen was a puppy, he ignored all of his actual toys and just wanted to play with water bottles, so this is great for him! It’s made of 100% natural sustainable materials, and the wool is anti-microbial and made to repel odor and bacteria. Spale Power Bites -Dog treats made with spinach, kale & parsley! Mugen is a VERY picky eater when it comes to treats, so I was concerned he may not like this but he gobbled it right up and once he was done was looking around for any crunch left! The parsley in this also helps with your pet’s breath if it’s a little gnarly! Dingo Market Cuts Chicken Jerky– Made in the USA, Mugen loved these immediately! CocoTherapy Fruit Crunch – These actually looked pretty good to me, but picky Mugen wouldn’t even try one! I’m not surprised, he won’t eat any kind of fruit I try to give him. Will be giving this to a family member’s less-picky dog! These are freeze-dried fruits (bananas, blueberries, cranberries, manoges & pineapples) with coconut oil. 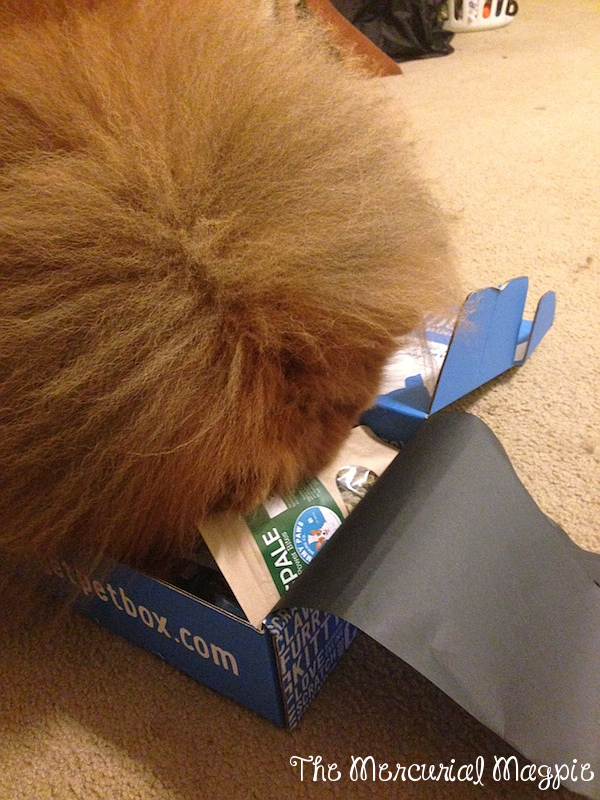 Overall, I think this box definitely is a good value and something that would be an excellent monthly treat for any pampered pet! 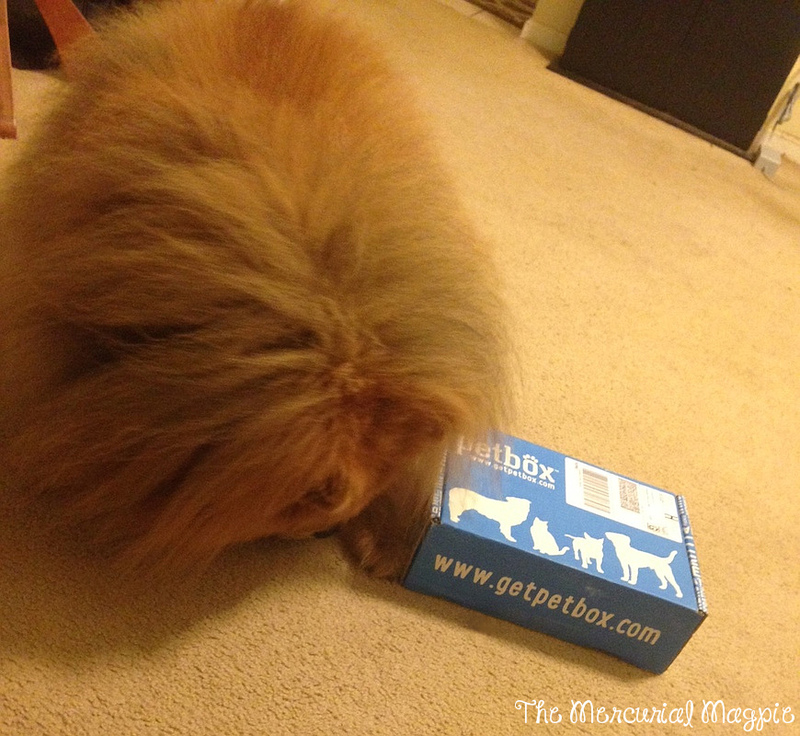 Puppy Mugen is…wishing that he’ll get a petbox in the future! Oh, your dream has come true now, puppy Mugen! !